They say the best way to person’s heart is thru their stomach, so why not show your special someone you care in a more heart-healthy way? It’s possible—and fun—with Little Potatoes. Creamers are heart healthy. They’re low-calorie, virtually sodium- and fat-free, and loaded with vitamins, antioxidants, fiber and essential minerals, including potassium, which counterbalances sodium and lowers blood pressure. 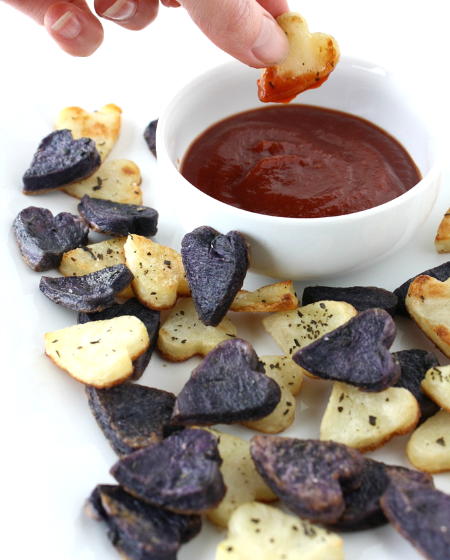 Roasted potato hearts are cute as a button, especially with our three-color Terrific Trio. Using this recipe for mouth-wateringly caramelized Garlic, Balsamic and Rosemary Roasted Potatoes, instead of cutting in half, slice the Creamers across to about ¼-inch thickness. Then use mini cookie cutters to stamp out heart shapes. Use the leftover cutouts for soup. A lovely side dish, these also make sweet looking dippers. What could be cozier than fondue for two? Indulge in creamy Truffle Cheese Fondue Little Potatoes. Delish with any of our Creamers, though we think the yellow inside/purple-blue outside Something Blue looks especially pretty dunked in melted Gruyere-Fontina enhanced with earthy black truffle oil. This is one of our favorites. First, make a heart-shaped meatloaf. Then follow the recipe for Garlic Parsley Mashed Potatoes in 10 Minutes. Mash as directed, then purée briefly in the blender until smooth. Place a star frosting tip into a plastic bag with the tip snipped off. Spoon the mashed potatoes into the bag, roll down the top to close and pipe a border of “frosting” around the meatloaf heart. Zig zag a little ketchup in the middle and serve immediately. Make a bowl of steaming soup: for example, gorgeously green Vegan Cheesy Potato and Asparagus Soup. Then swirl the coconut cream garnish into a heart shape, latte-style. Or dish up colorful Spicy Potato Coconut Curry Soup with Tofu in red heart-shaped bowls. Spice revs the libido, after all. Edible hearts will make this beautiful dish Valentine-worthy. Prepare Caprese Potato Salad as usual, but thinly slice the grilled Creamers once cooled. Then cut out a little notch in the top and trim the bottom to form a plump heart. Serve on a pretty red plate.